Alan Pardew does not anticipate a supporter backlash towards Yohan Cabaye if the midfielder is included in his Newcastle United squad to face Fulham this weekend. Cabaye has been told to make himself available for the weekend clash with Fulham, and Pardew has “seen signs” over the last few days that the midfielder’s stance has softened after his self-imposed exile from the first team. Cabaye has made himself unavailable for selection since the start of the season after Arsenal tabled a £10million bid for him in the run-up to the Manchester City defeat last week. Newcastle are understood to have placed an £18million valuation on the midfielder and would sell at any point up to Monday’s 11pm deadline. There remains a chance that Arsenal will not follow up their interest, however, which would leave both club and player trying to find a resolution to a messy saga. Cabaye was left out of the France squad as a consequence of his dispute with United - and Didier Deschamps warned both him and Newcastle target Bafetimbi Gomis about making decisions not to play that would be detrimental to the national team. “It’s a difficult question because it’s a few days away but, yes, if Arsenal don’t come back in then I think he’ll be involved in the game. 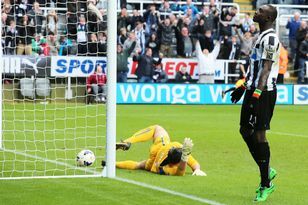 He’s shown signs of that and hopefully he will,” Pardew said. Asked how St James’ Park would react, he said: “I think it’ll be a positive reaction (from his supporters). The point I’m trying to make is that it’s not just Yohan Cabaye involved in this situation. “Other people are involved like his agents, and the bottom line - as I’ve said from day one - is that when you get situations like this, the same with Leighton Baines and Marouane Fellaini, you need to keep professional and let time run its course. “This will run it course until the deadline. At the moment I don’t think Yohan’s definitely going or is definitely staying, and this will have to run its course until that time. Pardew is treading a fine line between publicly carpeting for the player for his unprofessional behaviour and also being mindful of needing to re-integrate him into the squad if his move does not go through. He criticised him yesterday while expressing sympathy forthe position his agent had left him in. But by voicing a hope that supporters lay off Cabaye, the manager is clearly keeping his options open. Pardew said: “It’s something that everyone has an opinion on. “There’s some sympathy from myself towards Yohan for the pressure that he’s under from other sources. “I also have a disagreementon some of the things he’sdone and I’ve commented on that. “The bottom line is that he’s a great player, and our fans love great players and what our fans really love is really creative players. The transfer deadline continues to inch closer for United without a definitive breakthrough intheir long-running hunt for a striker. Bafetimbi Gomis remains the priority target and the club have resumed talks on terms with the striker. A disagreement over a potential signing-on fee is understood to have held up the transferin the past, but Newcastlehope to resolve this with a wage offer that works out better for him. Demba Ba is an alternative, although the player isnot understood to be keenon re-joining the club at thisstage. A £3m loan fee forthe Chelsea striker has been mooted. Pardew is looking forward to a point when all of these issues have been resolved. He said: “The weekend holds a lot of answers in the nextthree or four days, for not just us but a lot of the Premier League clubs. “You look at Spurs, they’re going to sign Eriksson, another great player going in there, what are Arsenal going to do? What about Everton? “Are those two guys going to stay or go, will they replace them? Who’s to say that Fellaini goes and they come knocking on our door for Ben Arfa? “All these scenarios we have to be on our guard about, which can impact on us.